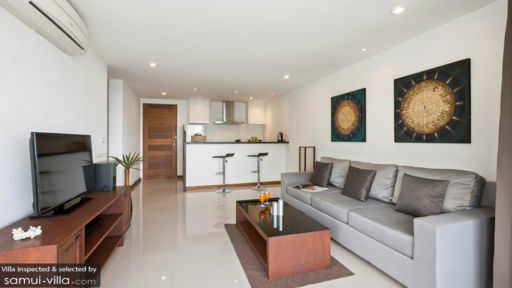 Tranquil Residence 1 is a vacation apartment that exemplifies contemporary minimalism. Making full use of the unit’s compact space, interiors – with a predominantly white color scheme – are appointed with complementary finely finished wood furnishings and fixtures, as well as with a few rattan and luxurious pieces. Amenities are distinctively of hotel and resort grade – to enhance the ease and fun of each and every guest. 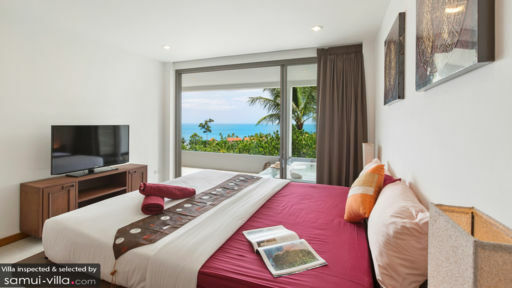 Built on a hillside above Lamai Beach, Tranquil Residence 1 affords you upland living with a modern and upscale appeal. The apartment has one bedroom with a king-sized bed, as well as a dedicated bathroom with a rain shower. This bedroom opens out to the balcony. On one end of the bedroom villa’s covered balcony is a hot tub. In its heated and soothing waters, you can immerse yourself and comfortably recline as you gaze out – entranced – to the vast ocean. Indoors – right from the balcony – is the living area with its large sofa in front of a widescreen TV. Here, you can all gather for the much-awaited next episode of the newest hit series. Or, for a rerun of your best-loved classic film. Out on the balcony is the alfresco dining area. On its square, glass-topped table that accommodates four, you can all get a taste of authentic Thai specialties – as well as foreign fare – freshly cooked by the onsite chef at the fully-equipped, modern kitchen at the far end of the indoor living space. The kitchen has a long counter which, provided with stools, doubles as a bar. On duty to deliver the everyday services of the apartment is staff led by a multi-lingual guest manager supported by a housekeeper, a chef and 24-hour security. The chef’s services will be charged separately. Bike and car rentals are available. 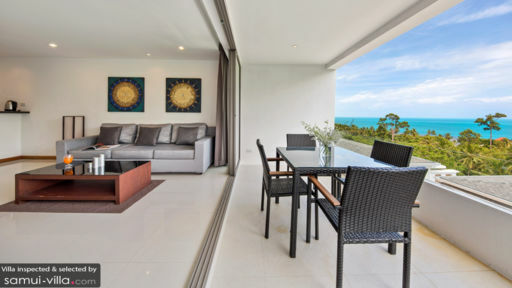 Tranquil Residence 1 is situated in Lamai. Just five minutes away by car from the bedroom villa is the less crowded and quiet Lamai Beach. Comb the white sand stretch to Silver Beach where you can, aside from swimming and sunbathing, also go snorkeling. Close by are Hin Ta and Hin Yai or Grandpa and Grandma rock formations. There is, as well, more water fun to discover at the Coco Splash Adventure And Water Park and at the Samui Aquarium. On another day tour, go sightseeing at Lamai Viewpoint, at Lamai Overlap Stone, at Pagoda Khao Chedi and at Wat Khunaram where you will see the mummified meditating monk Luong Pordaeng. You mustn’t also miss the Muay Thai matches at the Petchbuncha Boxing Stadium, as well as the bargain hunting at the Lamai Night Plaza.